Do you need appliance repair service to fix a broken fridge, oven, or washing machine? Do you need appliance installation for a new dryer or dishwasher? 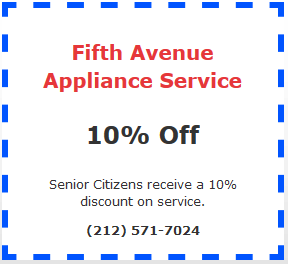 Turn to Fifth Avenue Appliance Service. Since 1967, we've helped homeowners in Manhattan and throughout NYC with top-notch appliance repairs at affordable rates. Let us put our experience to work for you! Fifth Avenue Appliance Service is your source for quality appliance repairs and installation in Manhattan, and all of NYC. Whether you need refrigerator repair for a unit that’s not cooling adequately or washing machine repair for a major leak, you can put your trust and confidence in our capable team. We’ve been in business since 1967, which makes us one of the most experienced appliance repair companies in town. We’re highly trained, with the knowledge and skill that it takes to give you great results. Plus, we offer some of the lowest prices around! Call now. We’re locally owned and based in Midtown Manhattan, and we’re pleased to provide residential appliance repairs throughout Brooklyn, The Bronx, and Queens. Wherever you live in NYC, you can count on Fifth Avenue Appliance Service for prompt, reliable appliance repair services. We believe that the key to success and customer satisfaction is offering superior workmanship and friendly and professional customer service, while also aiming for rates that are reasonable and competitive for the area. When you call us for refrigerator repair, dishwasher repair, oven repair, or repairs to any other appliance in your home, you can expect us to give you our best. Fifth Avenue Appliance Service is fully insured for appliance installation and repair for your security and peace of mind. We’re also EPA certified to handle refrigerants. But those aren’t the only things that help us stand out from the pack. We also back up our appliance repair technicians’ work with comprehensive warranties: 30 days for labor and 90 days for parts. If you hire us for washing machine repair or any other appliance repair service, and your problem recurs, you can count on us coming back to resolve the issue once and for all. For more information about working with Fifth Avenue Appliance Service, and to book your appliance installation or repair appointment, contact us today! We also offer appliance sales and appliance repair parts sales, if you need a new unit or assistance with DIY repairs. Whatever appliance problems you’re having, help is just a phone call away.